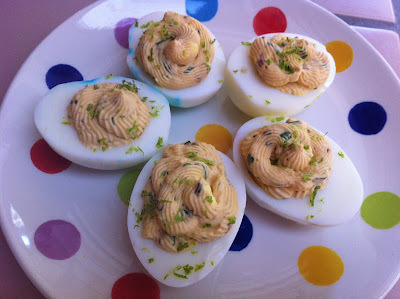 Spicy Deviled Eggs by Michael Symon: Mash 6 hard boiled egg yolks, 1/3 c. creme fraiche, 1/4 c. crumbled bacon, 1 t. Sriracha, 1 T. chopped cilantro, 1/ t. dijon mustard, 1/4 t. lime zest, 1 t. lime juice, and salt. Spoon into the egg whites; top with more lime zest. Put the steak in a zip lock bag and pour the marinade over it. Marinate for at least 30 minutes, and up to 4-6 hours. Preheat broiler, then broil for about 10 minutes per side, depending on how you like your meat done. Wrap it in foil to rest and cool off while you do cut your veggies. I put it in the fridge for about 15 minutes. Slice the steak. 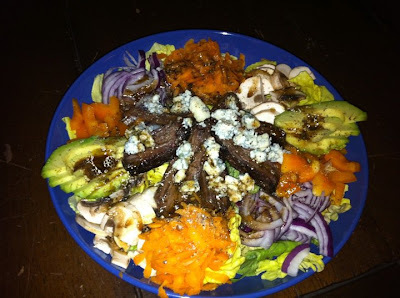 Put the lettuce in individual salad bowls, add the veggies, the steak, the bleu cheese crumbles, and drizzle the vinaigrette over the top. Enjoy! Put ingredients in a cruet and shake it well. Chill. Mix all ingredients together in a small bowl. Store in a glass spice jar.